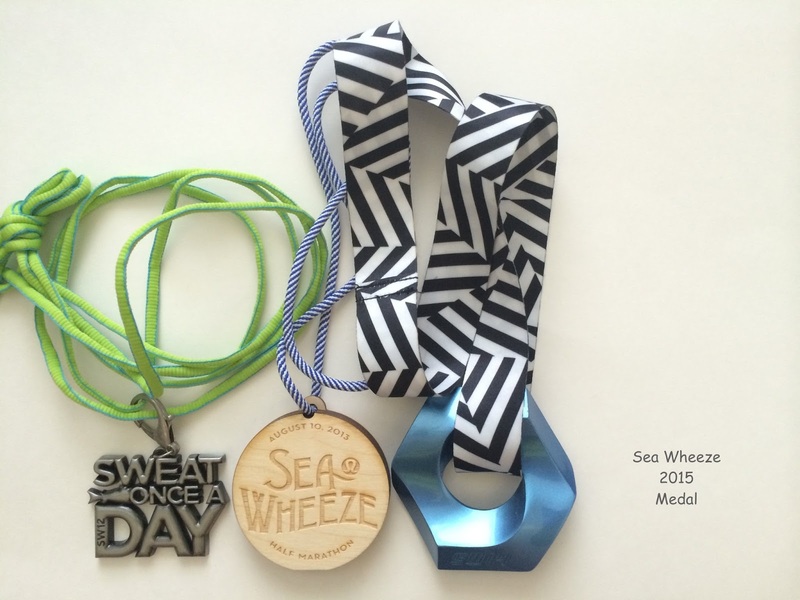 Lululemon Addict: Sea Wheeze Scramble!! Did they post the host hotels already? 2014 was amazing and 2015 will be epic!!! @Elizabeth - they did but most of them do not have links and you have to call. A lot have sold out of their SW rate rooms. What hotel did you pick? We chose the four seasons since the fairmont waterfront was full when I called. Yes! 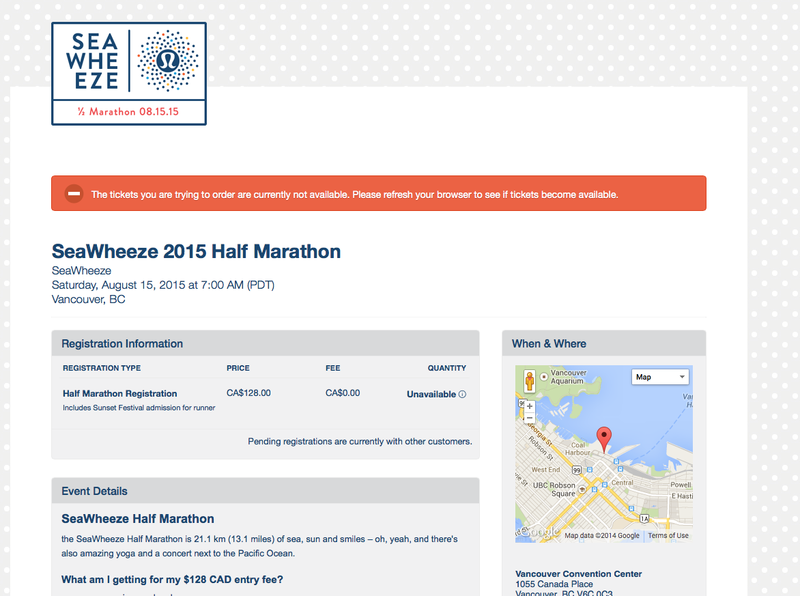 It will be my first Sea Wheeze, and I am so psyched! I clicked over right at 10, spent a few minutes in the waiting room, and got my email confirmation at 10:08. My mom got in as well. We joked that the 1/2 marathon will be a cakewalk compared to the stressful registration process. I am so excited to run! Have wanted to do the race in the past but never registered. This year I decided to do it. I registered at 10 and was put into the waiting room. A few minutes later I was able to sign up and received confirmation. I signed up for my hotel too! Quick question: I checked the box to pick my shorts up there. Do you think I can change my mind to have them mailed? I cannot believe how quickly registration went this year! I have a lot of friends who work for lululemon who were hoping to register this year and had to work, thinking that they would have a couple of days to sign up. Not so this year! I clicked right at 10 and got my confirmation at 10:06. Really excited to run this year! I remembered at 10:40. Bummer. Will try next year, and will make sure to set a reminder!! I refreshed my screen at exactly 12:00 cst and had only had a slight delay (maybe 2 seconds but enough to panic) until I moved to the registration information. Overall, much smoother than expected. Also purchased the festival ticket for my friend who is joining. I ran the first Seawheeze in 2012! **I will not be attending the eating contest! We're in! This will be my fourth SW and - although DH was registered for this year, he broke his neck two days before the race and was a spectator - DH's first SW. So excited! I had two computers, an iPad and iPhone all ready to go on the eventbrite link and started refreshing at 9:55. Got into the waiting room on all of them just as it opened. About five minutes later, the iPad let me in and I registered myself. Then my MacBook opened up so I could register hubs, and promptly crashed due to lack of memory (memo to self - upgrade the hard drive! ), then I freaked out for about 30 seconds until my iPhone screen changed and I was able to register hubs. About five minutes later, my other computer screen opened up for registration and I let it lapse. Booked hotel rooms already at several hotels, but think we'll end up at the four seasons. We stayed at the Westin Bayshore the first two years and loved it, but it hasn't been part of the block recently. Stayed at the Sheraton this year and had a horrible experience. The rooms are really small and our friend's room flooded. No thank you, I'll pay $30 more a night. Looking forward to seawheeze again!!! Signed up. Going to wait to see what the lulu corporate hotel partners are for employee rates and try to book ASAP once that info is released. See you at Seawheeze, LLA! This will be my first time (Seawheeze or any other half)! I forgot last year and didn't make it to registration before it was sold out. Thanks for the tip about the hotels selling out. I called and got the special $219 pricing for the Fairmont Hotel Vancouver tonight. Lol, you are a pro at this, Jen. I had a couple of hotels lined up, too, but once we got into the Fairmont I let the other one go. @ anon 10:16 pm - you are going to have a blast! @ anon 6:39 pm - I don't know about that. I would bet probably not but you never know. @ilovefetacheese - the Fairmont Vancouver again. We like that hotel. I did try calling the Marriott Pinnacle to get closer to the start but they were out of SW rate rooms. @ Shannon - you are going to love it. My signup was complicated a bit by a visit from the A/C repairman. His window to show up was between 9 and 10 and of course he showed up at 10:01. I had put a note on the front door that I HAD to be on the computer at 10 am so just go around back but it turns out he was a fellow runner and understands insane sign ups. He is also registered for the upcoming Disney Avengers and Star Wars races, lol. LLA -- that is hysterical about the A/C guy -- so funny that he is a runner and gets it. I had the same experience as @Shannon and skipped the waiting room immediately at 10 EST. My sister registered my husband and we were good to go. I swore I wouldn't do it in 2015 because I couldn't handle the stress of registration, but...the trip is so amazing, Vancouver has taken on near-mythic status as a getaway for us. @Jen -- I'm pretty sure we saw you (or, rather, your poor husband in a neck brace) in Vancouver -- which is so funny to me since you and I seem to be on the same race schedule with all four SeaWheezes and a string of Bostons. I am beyond thrilled that I got in for my first SeaWheeze and very first half marathon! Any tips for newbies? Glad I booked my hotel already as it seems a lot of them are booked. Does anyone have feedback on the Marriott? Looking forward to a great race with everyone in 2015! @luluFemon - too funny about August birthdays. The first two Sea Wheezes fell right on top of my oldest son's birthday. 4:48 again--thanks for the advice! I've only done 5ks and can now get up to running about 5 miles comfortably. I'll look into the Hal Higdon plan. Glad I have almost a year to train! I made it in this year. It was my first attempt at registering for seawheeze and I didn't have any issues. This is my first Seawheeze and first half. I'm so excited I can't contain myself. How do you remain calm for the entire year we have to wait for the race? On another note, Lulu is shipping to the midwest USA from a warehouse in Ohio now. My Tuesday order is scheduled to arrive Friday. Yay! I am jealous. you guys are going to have a great time. @lulufemom - too funny! Are you headed back to Boston as well? I registered yesterday and am just awaiting confirmation (-16:40). Let's meet up there! Is there any benefit beyond price to staying in the partner hotels? I got in! So excited! And booked hotel! Anything I'm forgetting please somebody let me know! @ anon 4:52 pm - the last couple of years the Fairmont has given us a small Sea Wheeze welcome snack but other than that nothing.